Meta: I’m not say­ing any­thing new here. There has been a lot of re­search on the topic, and pop­u­lar books like Stum­bling on Hap­piness have been writ­ten. Fur­ther­more, I don’t think I have ex­plained any of this par­tic­u­larly well, or pro­vided par­tic­u­larly en­light­en­ing ex­am­ples. Nev­er­the­less, I think these things are worth say­ing be­cause a) a lot of peo­ple have an “I know what I like” at­ti­tude, and b) this at­ti­tude seems pretty harm­ful. Just be sure to treat this as more of an ex­plo­ra­tory post than an au­thor­i­ta­tive one. I’m just not one of those peo­ple who en­joys “deeper” ac­tivi­ties like read­ing a novel. I like watch­ing TV and play­ing video games. I’m just not one of those peo­ple who likes healthy foods. You may like sal­ads and swear by them, but I am differ­ent. I like pizza and french fries. I’m just not an in­tel­lec­tual per­son. I don’t en­joy learn­ing. I’m just not into that early re­tire­ment stuff. I need to main­tain my cur­rent lifestyle in or­der to be happy. I’m just not into “good” movies/​mu­sic/​art. I like the Top 50 stuff. Who are you to tell me what I do and don’t like? How can you pos­si­bly know? I’m the one who’s in my own head. I know how these things make me feel. Per­son: No they’re not! WTF are you talk­ing about? How can you say that they are? I can see with my eyes that they’re not! I un­der­stand the frus­tra­tion. It feels like they’re differ­ent shades. It feels like it is stupidly ob­vi­ous that they’re differ­ent shades. But some­times, some­times your brain lies to you. The image of the squares is an op­ti­cal illu­sion. Neu­ro­scien­tists and psy­chol­o­gists study them. And they write books like this about them. The ques­tion of know­ing what you like can be a he­do­nic illu­sion (that’s what I’ll de­cide to call it any­way). Neu­ro­scien­tists and psy­chol­o­gists study these illu­sions too. And they write books like this about them. They have found that we’re ac­tu­ally re­ally bad at know­ing what will make us happy. At know­ing what we do, and don’t like. His book Stum­bling on Hap­piness be­came a na­tional best­sel­ler last sum­mer. Its cen­tral fo­cus is “prospec­tion”—the abil­ity to look into the fu­ture and dis­cover what will make us happy. The bad news is that hu­mans aren’t very skil­led at such pre­dic­tions; the good news is that we are much bet­ter than we re­al­ize at adapt­ing to what­ever life sends us. The rea­son is that hu­mans hold fast to a num­ber of wrong ideas about what will make them happy. Iron­i­cally, these mis­con­cep­tions may be evolu­tion­ary ne­ces­si­ties. “Imag­ine a species that figured out that chil­dren don’t make you happy,” says Gilbert. “We have a word for that species: ex­tinct. That last one was pretty pow­er­ful, wow. I think that the im­pli­ca­tions of this are all pretty huge. We all want to be happy. We all want to thrive. We make thou­sands and thou­sands of lit­tle de­ci­sions to this end. We de­cide to have fried chicken for din­ner, and that hav­ing sal­ads isn’t worth the effort, de­spite what­ever long term health benefits. We de­cide that video games are a nice, fun, re­lax­ing way to de­com­press af­ter work. We de­cide that work­ing a cor­po­rate job is worth it be­cause we “need the money”. All of these de­ci­sions shape our lives. If we’re get­ting them wrong, well, then we’re not do­ing a good job of shap­ing our lives. And if we’re bas­ing these de­ci­sions off of our in­tu­itions, ac­cord­ing to the pos­i­tive psy­chol­ogy re­search, we’re prob­a­bly screw­ing up a lot. So then, I pro­pose that we ap­proach these sorts of ques­tions with more cu­ri­os­ity. The first virtue is cu­ri­os­ity. A burn­ing itch to know is higher than a solemn vow to pur­sue truth. To feel the burn­ing itch of cu­ri­os­ity re­quires both that you be ig­no­rant, and that you de­sire to re­lin­quish your ig­no­rance. If in your heart you be­lieve you already know, or if in your heart you do not wish to know, then your ques­tion­ing will be pur­pose­less and your skills with­out di­rec­tion. Cu­ri­os­ity seeks to an­nihilate it­self; there is no cu­ri­os­ity that does not want an an­swer. The glory of glo­ri­ous mys­tery is to be solved, af­ter which it ceases to be mys­tery. Be wary of those who speak of be­ing open-minded and mod­estly con­fess their ig­no­rance. There is a time to con­fess your ig­no­rance and a time to re­lin­quish your ig­no­rance. The eighth virtue is hu­mil­ity. To be hum­ble is to take spe­cific ac­tions in an­ti­ci­pa­tion of your own er­rors. To con­fess your fal­li­bil­ity and then do noth­ing about it is not hum­ble; it is boast­ing of your mod­esty. Who are most hum­ble? Those who most skil­lfully pre­pare for the deep­est and most catas­trophic er­rors in their own be­liefs and plans. Be­cause this world con­tains many whose grasp of ra­tio­nal­ity is abysmal, be­gin­ning stu­dents of ra­tio­nal­ity win ar­gu­ments and ac­quire an ex­ag­ger­ated view of their own abil­ities. But it is use­less to be su­pe­rior: Life is not graded on a curve. The best physi­cist in an­cient Greece could not calcu­late the path of a fal­ling ap­ple. There is no guaran­tee that ad­e­quacy is pos­si­ble given your hard­est effort; there­fore spare no thought for whether oth­ers are do­ing worse. If you com­pare your­self to oth­ers you will not see the bi­ases that all hu­mans share. To be hu­man is to make ten thou­sand er­rors. No one in this world achieves perfec­tion. You can be wrong about what you like, and you of­ten are. Bob: No they’re not! WTF are you talk­ing about? How can you say that they are? I can see with my eyes that they’re not! Alice: Ob­serve that if you use a graph­ics ed­i­tor pro­gram to ex­am­ine a pixel in the mid­dle of re­gion A, and a pixel in the mid­dle of re­gion B, you will see that they are the same color; or you could use a pho­tome­ter to di­rectly mea­sure the spec­tral power dis­tri­bu­tions of light be­ing emit­ted by your com­puter dis­play from ei­ther pixel, and like­wise you will find those curves iden­ti­cal. Bob: Yeah? So? What of it? Sup­pose I mea­sure the spec­tral power dis­tri­bu­tions of light reach­ing my eyes from a ba­nana at dusk, and a tomato at noon, and find them iden­ti­cal; should I con­clude that a ba­nana and a tomato are the same color? No; they look like they have differ­ent col­ors, and in­deed they do have differ­ent col­ors. What about the same ba­nana at noon, and then at dusk—the light reach­ing my eyes from the ba­nana will have differ­ent spec­tral power dis­tri­bu­tions; has the ba­nana changed color? No, it both looks like, and is, the same color in both cases. Alice: What? What does that have to do with any­thing? The pix­els re­ally are the same! Bob: What is that to me? This is an image of a cylin­der stand­ing on a checker­board. I say that square A on the checker­board, and square B on the checker­board, are of differ­ent col­ors. Just as my vi­sual sys­tem can tell that the tomato is red, and the ba­nana yel­low, re­gard­less of whether ei­ther is viewed at noon or at dusk, so that same vi­sual sys­tem can tell that these two checker­board squares have differ­ent col­ors. Your so-called “illu­sions” can­not so eas­ily fool hu­man vi­sion! Alice: But… it’s a ren­dered image. There is no checker­board. 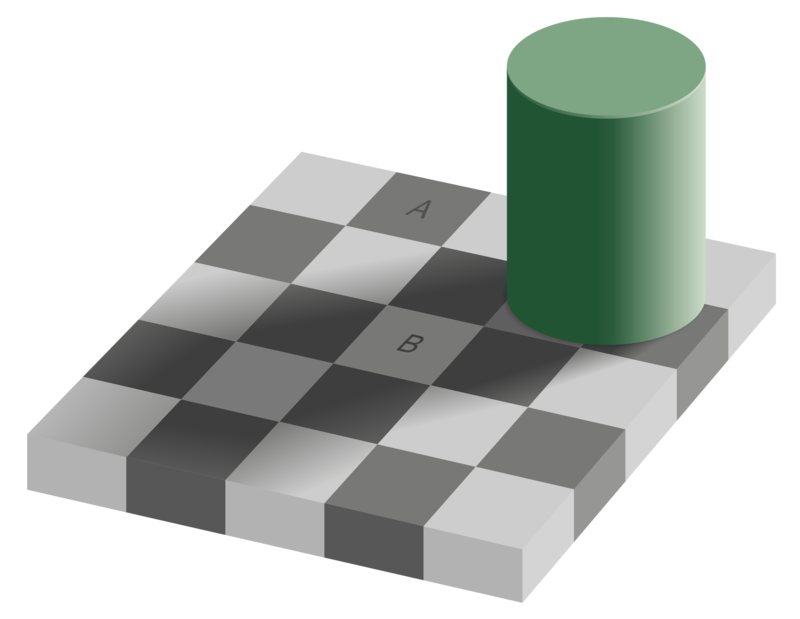 Bob: Then there is no fact of the mat­ter about whether A and B are the same color. I’m not sure if I un­der­stood the point you’re mak­ing, but it sounds like the point is that, even if the pix­els are the same color, the im­por­tant thing is to be able to dis­t­in­guish the ob­jects. To see that the tomato and ba­nana are differ­ent things even if they have the same pix­els. I sup­pose more gen­er­ally the idea is that with an illu­sion, it may be an illu­sion in some lower level sense, but not an illu­sion in a more prac­ti­cal sense. Is that ac­cu­rate? If so, I’m not sure how it would ap­ply to “he­do­nic illu­sions”. I sup­pose there are cases where we are wrong about think­ing some­thing pro­vides hap­piness, but cor­rect in some other more im­por­tant way. But I’m hav­ing trou­ble think­ing of con­crete ex­am­ples of what that other, more im­por­tant thing is, and how it is dis­tinct from “lower level hap­piness”. I would guess that there are some ways in which your point ap­plies to “he­do­nic illu­sions”. There may be some situ­a­tions where we’re wrong about “low level hap­piness” but cor­rect about a more im­por­tant thing. But I would also guess that it is not to the ex­tent where we can re­li­ably think “I know what I like”. The pur­pose of our vi­sual sys­tem—and, speci­fi­cally, the pur­pose of our color vi­sion—is to dis­t­in­guish ob­jects. Similarly, if you see a pho­to­graph of a phys­i­cal scene such as that pic­tured in the illus­tra­tion, it may be that the spec­tral power dis­tri­bu­tions of the light reach­ing your eyes from the pix­els rep­re­sent­ing the two iden­ti­fied re­gions of the phys­i­cal checker­board a pic­ture of which you are look­ing at, will, again, match ar­bi­trar­ily closely. But once again, you will cor­rectly per­ceive the two pic­tured squares as hav­ing differ­ent col­ors—i.e., as hav­ing had, in the real-world scene of which the pic­ture was taken, differ­ent sur­face spec­tral re­flec­tance func­tions. In both these cases, there is some real-world fact, which you are per­ceiv­ing cor­rectly. There is, then, some other real-world fact which you are not per­ceiv­ing cor­rectly (but which you also don’t par­tic­u­larly care about). Once again: if I look at a real-world scene such as the one de­picted, or a pho­to­graph of that scene, and I say “these two squares have differ­ent col­ors”, and by this I mean that the phys­i­cal ob­jects de­picted have differ­ent col­ors, I am not mis­taken; I am en­tirely cor­rect in my judg­ment. But! The pic­ture in ques­tion is not a phys­i­cal scene in the real world; nor is it a pho­to­graph of such a scene. It is ar­tifi­cial. It de­picts some­thing which does not ac­tu­ally ex­ist, and never did. There is no fact of the mat­ter about whether the iden­ti­fied checker­board squares are of the same color or differ­ent col­ors, be­cause they don’t ex­ist; so there isn’t any­thing to be right or wrong about. This means that the ques­tion—“are these two re­gions the same color, or differ­ent col­ors?”—is, in some sense, mean­ingless. Once again, the pur­pose of our vi­sual sys­tem is to per­ceive cer­tain prac­ti­cally rele­vant fea­tures of real-world ob­jects. The “op­ti­cal illu­sion” in ques­tion feeds that sys­tem non­sense data; and we get back a non­sense an­swer. But that doesn’t mean we’re an­swer­ing in­cor­rectly, that we’re mak­ing a mis­take; in fact, there isn’t any right an­swer! Once again, note that if we en­coun­tered this situ­a­tion in the real world, we would cor­rectly note that the two checker­board squares have differ­ent col­ors. If we had to take some ac­tion, or make some de­ci­sion, on the ba­sis of whether square A and square B were the same color or differ­ent col­ors, we would there­fore act or de­cide cor­rectly. Act­ing or de­cid­ing on the ba­sis of a be­lief that squares A and B are of the same color, would be a mis­take! Con­trast this with, for ex­am­ple, color blind­ness. If I can­not see the differ­ence be­tween red and green, then I will have quite a bit of trou­ble driv­ing a car—I will mis-per­ceive the state of traf­fic lights! Note that in this case, you can be sure that I won’t ar­gue with you when you tell me that I am per­ceiv­ing the traf­fic lights in­cor­rectly; there is no sense in which, from a cer­tain per­spec­tive, my judg­ment is ac­tu­ally cor­rect. No; I sim­ply can’t see a differ­ence which is demon­stra­bly pre­sent (and which other peo­ple can see just fine); and this is clearly prob­le­matic, for me; it causes me to take sub-op­ti­mal ac­tions which, if I per­ceived things cor­rectly, I would do oth­er­wise (more ad­van­ta­geously to my­self). The take­away is this: if you think you have dis­cov­ered a bug in hu­man cog­ni­tion, it is not enough to demon­strate that, if pro­vided with data that is non­sen­si­cal, weird (in a “doesn’t cor­re­spond to what is en­coun­tered in the real world” way), or de­signed to be de­cep­tive, the cog­ni­tive sys­tem in ques­tion yields some (ap­par­ently) non­sen­si­cal an­swer. What is nec­es­sary is to demon­strate that this alleged bug causes peo­ple to act in a way which is clearly a mis­take, from their own per­spec­tive—and that is far more difficult. In the “sur­vival-crit­i­cal task which is the source of se­lec­tion pres­sure to de­velop and im­prove said sys­tem” sense. And if you de­cide that in some given case, you do care about this sec­ondary fact, you can use tools de­signed to mea­sure it. But usu­ally, this other fact is of aca­demic in­ter­est at best. Thank you for a re­ally great ex­pla­na­tion, I un­der­stand now. I would say that I feel about 90% sure that it isn’t true in the hap­piness case. I am not par­tic­u­larly fa­mil­iar with the re­search, but in gen­eral, we have a ton of blind spots and bi­ases that are harm­ful in a prac­ti­cal, real world sort of sense, and so a claim that we also have one in the con­text of hap­piness seems very plau­si­ble. It also seems plau­si­ble be­cause of the evopsych rea­son­ing. And most of all, rep­utable sci­en­tists seem to be warn­ing us about the pit­falls of think­ing we know what we like. If they were just mak­ing an aca­demic point that we have these blind spots, but these blind spots aren’t ac­tu­ally rele­vant to ev­ery­day peo­ple and ev­ery­day life, I wouldn’t ex­pect there to be best­sel­ling books about it like Stum­bling on Hap­piness. But, it is definitely pos­si­ble that I am just mis­in­ter­pret­ing and mi­s­un­der­stand­ing things. If I am—if we aren’t ac­tu­ally get­ting some­thing wrong about hap­piness that is im­por­tant in a prac­ti­cal sense—then that is very im­por­tant. So that I can up­date my be­liefs, and so that I can ei­ther edit or delete this post. ..but which don’t get se­lected out, for some rea­son. Blind spots and bi­ases can be harm­ful to your goals with­out be­ing harm­ful to your re­pro­duc­tive fit­ness. Be­ing wrong about which fu­ture situ­a­tions will make you (per­ma­nently) hap­pier is an ex­cel­lent ex­am­ple of such a blind spot. if you in­sisted that the “right” an­swer is that A and B are the same color, you would (as I claim, and ex­plain, above) be wrong—or, more pre­cisely, you would be right in a use­less and ir­rele­vant way, but wrong in the im­por­tant and prac­ti­cal (but still quite spe­cific) way. Now, how sure are you that the same isn’t true in the hap­piness case? An ex­cel­lent point! I won­der how one can figure out this dis­tinc­tion in the he­do­nic case. If I can­not see the differ­ence be­tween red and green, then I will have quite a bit of trou­ble driv­ing a car—I will mis-per­ceive the state of traf­fic lights! Un­less they are con­ve­niently ar­ranged in a set way, which you may mem­o­rize, such as left to right/​bot­tom to top = red, yel­low, green. Lest any­one get the idea that the par­ent com­ment is be­ing ig­nored merely be­cause it’s “pedan­tic” or “misses the point” or some such, I want to point out that it’s also mis­taken. This fas­ci­nat­ing and en­gross­ing doc­u­ment is Part 4 of the Man­ual of Uniform Traf­fic Con­trol De­vices for Streets and High­ways (a.k.a. “MUTCD”), pub­lished by the Fed­eral High­way Ad­minis­tra­tion (a di­vi­sion of the United States Depart­ment of Trans­porta­tion). Note that the iconog­ra­phy is the same and the ori­en­ta­tion and ar­range­ment is the same. But the col­ors are differ­ent! For an­other ex­am­ple, take a look at MUTCD p. 487 vs. p. 488 (PDF pp.55–56). In sum­mary, it is not pos­si­ble to re­li­ably de­ter­mine the col­ors of traf­fic con­trol sig­nals from their po­si­tions in a traf­fic light ar­range­ment. I think there are times when peo­ple want some­thing but know they won’t ac­tu­ally like it; that it won’t ac­tu­ally make them happy. For ex­am­ple, pizza and french fries might be some­thing that peo­ple want, but that they know won’t ac­tu­ally make them happy. I used pizza and french fries as an ex­am­ple, and maybe it wasn’t a good choice. Still, I think that there are still many other times where peo­ple are ac­tu­ally wrong about what they like, enough such that it is very harm­ful. I think that think­ing of peo­ple as want­ing hap­piness is similar to try­ing to un­der­stand speedrun­ning through the eyes of a child who is still at the stage of iden­ti­fy­ing with the video game char­ac­ter. They can’t think ra­tio­nally about strate­gies that de­crease hit points too much, be­cause that means your char­ac­ter is get­ting *hurt. * To the speedrun­ner, health points are just one more di­men­sion of trade­off in a con­vex op­ti­miza­tion space. Why is the op­ti­mi­sa­tion space con­vex? am­bigu­ous word­ing, the op­ti­miza­tion they’re do­ing over the space is con­vex. Also I don’t think choice of op­ti­miza­tion func­tion is su­per im­por­tant for the metaphor. Just to give the fla­vor. Ob­vi­ous com­ment: Looks like a strong ar­gu­ment against ap­proval di­rected AI al­ign­ment ap­proach. Maybe less ob­vi­ous one: As­sump­tion that “peo­ple want to be happy” may be wrong. Peo­ple of­ten have rea­son­able goals which—and they know it—will make them less happy by all typ­i­cal mea­sures, but they still want it and ap­prove it. Ex­am­ples: pe­rus­ing sci­en­tific car­rier or hav­ing chil­dren. I’m cu­ri­ous why you chose these par­tic­u­lar ex­am­ples. I think they’re mostly quite bad and de­tract from the rea­son­able point of the over­all post. The first three, and the fifth, I’d char­ac­ter­ise as “ac­quired tastes”: they’re things that peo­ple may come to en­joy over time, but of­ten don’t cur­rently en­joy. So even some­one who would grow to like read­ing nov­els, and would have a bet­ter life if they read more nov­els, may be to­tally cor­rect in stat­ing that they don’t en­joy read­ing nov­els. The fourth is a good ex­am­ple for many peo­ple, but many oth­ers find that re­tire­ment is bor­ing. Also, pre­dict­ing what your life will look like af­ter a rad­i­cal shift is a pretty hard prob­lem, so if this is the sort of thing peo­ple are wrong about it doesn’t seem so se­ri­ous. More gen­er­ally, whether or not you en­joy some­thing is differ­ent from whether that thing, in the fu­ture, will make you hap­pier. At points in this post you con­flate those two prop­er­ties. The ex­am­ples also give me elitist vibes: the im­pli­ca­tion seems to be that up­per-class pur­suits are just bet­ter, and peo­ple who say they don’t like them are more likely to be wrong. (If any­thing, ac­tu­ally, I’d say that peo­ple are more likely to be mis­cal­ibrated about their en­joy­ment of an ac­tivity the more pres­ti­gious it is, since we’re good at de­ceiv­ing our­selves about sta­tus con­sid­er­a­tions). I’m cu­ri­ous why you chose these par­tic­u­lar ex­am­ples. I wanted to think of bet­ter ones but was hav­ing trou­ble do­ing so, didn’t want to ded­i­cate the time to do­ing so, and figured that it would be bet­ter to sub­mit a mediocre ex­plo­ra­tory post about a topic that I think is im­por­tant than to not post any­thing at all. More gen­er­ally, whether or not you en­joy some­thing is differ­ent from whether that thing, in the fu­ture, will make you hap­pier. At points in this post you con­flate those two prop­er­ties. I agree, and I think it would have been a good thing to dis­cuss in the main post. “I know that I don’t like sal­ads now; I think I could de­velop a taste for them, but I don’t want to or can’t bring my­self to do so” is definitely a differ­ent thing than “I don’t like sal­ads now, so I’m not go­ing to eat them” and “I don’t like sal­ads now and I don’t think that I could ever like them”. By dis­cussing the above point, I think it would have the benefit of be­ing more clear about what ex­actly the prob­lem is. In par­tic­u­lar, that “I know that I don’t like sal­ads now; I think I could de­velop a taste for them, but I don’t want to or can’t bring my­self to do so” is a differ­ent prob­lem. The ex­am­ples also give me elitist vibes: the im­pli­ca­tion seems to be that up­per-class pur­suits are just bet­ter, and peo­ple who say they don’t like them are more likely to be wrong. I definitely don’t mean to im­ply that this is true. I per­son­ally don’t think that it is. But I do see how the ex­am­ples I chose would give off that vibe, and I think it would have been bet­ter to come up with ex­am­ples that demon­strate a wider range of “I know what I like” at­ti­tudes. I definitely don’t mean to im­ply that this is true. I per­son­ally don’t think that it is. On bal­ance, I’m ac­tu­ally not sure of what I think about whether “high class” things tend to provide more hap­piness than “low class” things, so I spoke too soon in the pre­vi­ous com­ment. I do agree that we of­ten do things that ul­ti­mately are not in our own in­ter­ests but I don’t re­ally see that as a huge prob­lem. We’re rather com­plex in our ex­is­tence. I don’t think we have some in­ter­nal util­ity func­tion with a sin­gle met­ric to max­i­mize. What we end up deal­ing with is more a con­strained max­i­miza­tion case. More­over, the var­i­ous mar­gins we max­i­mize on are of­ten not only mu­tu­ally ex­clu­sive but mu­tu­ally in­com­pat­i­ble.